If you can click on any photo on this page, you can send it as an electronic postcard - just by clicking it. The last excursion begins usually one length of excursion before the closing time of the monument. Entrance fee: full, reduced (eg. children, students, retired), foreigners full, foreigners reduced (usually with foreign language speaking guide). Parking: first number for cars, the second one for buses. 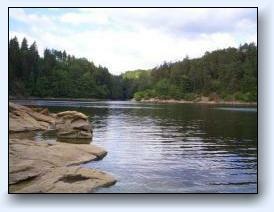 Region of South Bohemia, in a bee line 15 km north from the city Pisek. 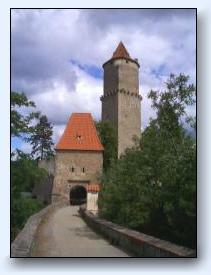 The history of Zvíkov Castle began with the royal house of Přemyslovec. Zvíkov is an outstanding example of Czech medieval secular architecture. The initial construction of Zvíkov took place during the rule of Wenceslas I (1230 - 1253). Written records mention Konrad, founder of the Lords of Janovice, as burgrave of the castle in 1234. Zvíkov was a favorite of King Wenceslas I, who often stayed here. Přemysl Otakar II eventually ruled the Czech lands (1253-1278), and continued construction of the castle. He appointed Hirza as the Zvíkov burgrave in 1250. Under Hirza, the main construction of the inner area began, including the royal palace and the surrounding fortifications. In 1306 the house of Přemysl died out with the assassination of Wenceslas III in Olomouc, so the castle was ceded to Henry of Rožmberk. 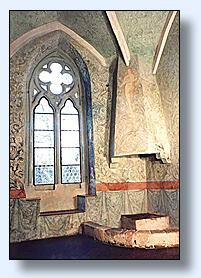 The castle obtained its greatest fame unde Charles IV, who had it thoroughly renovated. Until Karlštejn Castle was completed, Zvíkov served as a sanctuary for the Crown Jewels. The importance of Zvíkov as an eminent royal castle diminished when this distinction was lost. Soon afterwards, the castle began to change hands frequently, as it was given as a pledge for service or monetary loans. Zvíkov was most often exchanged between two prominent and wealthy families - the Lords of Rozmberk and the Lords of Švamberk. 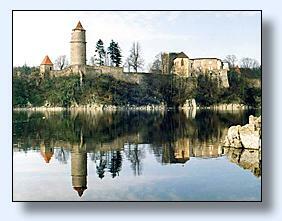 In 1429, while in the possession of Emperor Zikmund, The castle was beseiged by the Taborites during the Hussite Wars. It was not conquered at that time. 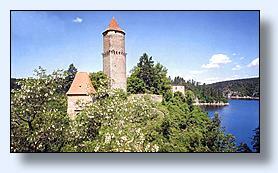 In 1437, Lord Oldřich of Rožmberk, leader of the Catholic nobility, obtained the castle from the Emperor. Zvíkov remained a royal castle once again until 1575, when King Maxmilian II sold it to the Lords of Švamberk, as noted in the Register of Landed Property. The Švamberks carried out extensive Renaissance renovations, but the castle retained much of its original character. Its excellent fortification system enabled its defenders to resist aggressors, even during the Thirty Years War. However, in spring of 1622, the outnumbered Zvíkov garrison surrendered and the castle was sacked by imperial troops. Otherwise only after previous negotiation. Without guide, with guide po predchozi dohode, 45 min, maximum 50 osob (trasa v arealu kralovskeho palace je volna, zamerena na mimoradne kvalitni architekturu s naznakove instalovanymi prostorami Rytirskeho salu, pripravny jidel, Svatebni sine, atd. Volne je pristupna i kaple sv. Vaclava s nastennymi malbami z 80. let 15. stoleti and oltarem Mistra zvikovskeho Oplakavani.). Reservation of tours, saling the souvenir, weddings on demand (zajistuje MU Zvikovske Podhradi), obcerstveni.